Chicago, IL – – The Illinois Diversity Council is proud to recognize David Bozeman with the 2016 Illinois Leader of the Year Award. This award will be presented on October 4, 2016 during the 3rd Annual Illinois Leadership Conference at the Hilton Chicago. 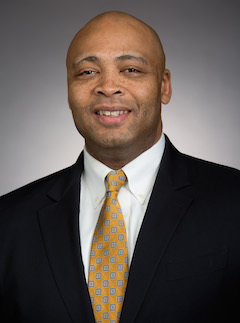 Bozeman is a Senior Vice President at Caterpillar Inc., the world’s leading manufacturer of construction and mining equipment, diesel and natural gas engines, industrial gas turbines and diesel-electric locomotives. The Illinois Leader of the Year award is reserved for an individual who is a proven leader within their organization. They possess the ability to overcome the greatest of obstacles, resolve problems, and lead their peers on the path to success. In addition to being dedicated to their own professional goals, the Illinois Leader of the Year awardee is committed to advocating for truly inclusive work environments. After earning a Bachelor of Science in Manufacturing Engineering Technology/Mechanical Design from Bradley University, Bozeman began a successful career in the manufacturing industry with Harley-Davidson Motor Company. Following his time at Harley-Davidson, he joined Caterpillar in 2008 as a general manager for the company’s Specialty Products Business Unit. Bozeman’s proven ability to effectively lead his team to success allowed him to progress into his current role as senior vice president of the Caterpillar Enterprise System Group. Formed in 2013, this order-to-delivery organization brings together critical processes and support groups to further improve Caterpillar’s worldwide manufacturing and supply chain capabilities. In addition to his commitment to Caterpillar, Bozeman is also an active leader in various leadership organizations. He is an active board member for organizations such as Weyerhaeuser, the Manufacturers Alliance for Productivity and Innovation (MAPI), and the Society of Manufacturing Engineers Education Foundation. Bozeman is also a member on the Board of Trustees at his alma mater, Bradley University. Registration for the Illinois Leadership Conference can be completed at www.illinoisdiversitycouncil.com/register. For more information, contact Dennis Kennedy at dennis.kennedy@nationaldiversitycouncil.org.